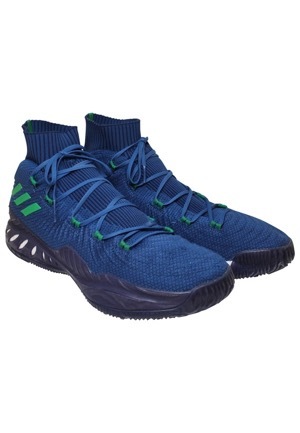 The number one overall pick in the 2014 NBA draft Andrew Wiggins wore these sneakers in multiple games of the 2017-18 season with the Minnesota Timberwolves. Adidas manufactured blue sneakers with white and green trim that are sans the manufacturer’s tag. 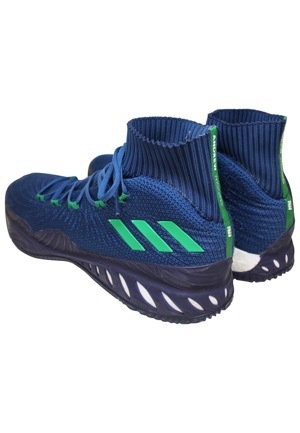 Vertically down the back of the sneakers on a green strip reads “ANDREW WIGGINS” in white. These sneakers are properly tagged, were presented to us as game-used and show use.